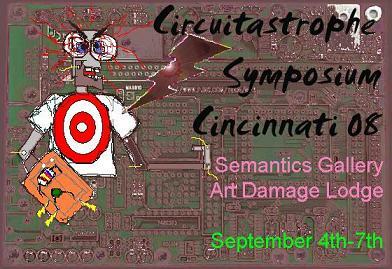 Mark 1/2 Mang is throwing one heck of a bash this September in Cincinnati. The event is one that will attract artists as worthy as Bent Fest has in the past. Plus it promises a chance to hear Reed Ghazala speak on the subject of the history of circuit-bending, personal stories, slides, dye migration, plus bent devices he’s made. This sounds like something I had to ask more about…so I did. Q: What is Circuitastrophe Symposium? What could one expect if going to the festival? 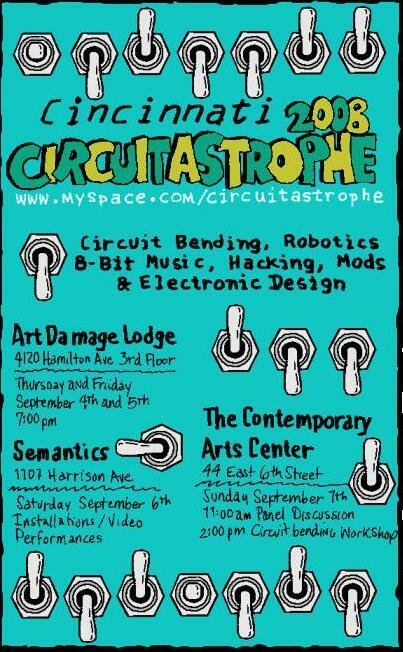 Mark: Circuitastrophe is a forum for people to present their Bent, Modified, Hacked, Robotic, and Electronic contraptions. Secondly it is designed to educate and engage critical thinking behind the designs, theories, and history of Electroniqueness (?) using presentations, installations, lectures, workshops, performances, and a panel discussion. Performance wise we have circuit-benders, a couple of 8 bit performers, and some musique concre..ters (not that circuit-bending isn’t musique concrete). Many performers have visual components to their performance. The list is at the end of the interview. There are two primer events; one a circuit-bent performance on Mon, Sept 1st on W.A.I.F. 88.3 FM from 1PM-3PM, and the second is an in-store circuit-bent performance at Shake It Records Wednesday the 3rd of Sept. If anyone is interested in performing those shows please contact me. Their may be another radio slot available on W.A.I.F., as the Art Damage radio show has just been reinstated Tuesday mornings from 12:00 AM – 2:00 PM (details soon to follow in the comments section). We are trying to do a performance on Fountain Square (Cincinnati’s town square) using the Jumbo-Tron. The Contemporary Arts Center just contacted me about doing a lunch time performance on Mon, Sept 8th. So the festival may go one more day. Q: Where’s the festival being held? Mark: We have several locations; the idea is gathering people from differing disciplines to congregate and share ideas. Plus we hope more locations will translate to a larger more diverse turnout. Thursday and Friday we will be at The Art Damage Lodge (former SkuLLLab, and Art Damage radio people) from 7 PM – 2:00 AM. semantics (a local artist co-op that doesn’t capitalize their s) will host the installations and Saturday performances from 7 PM – 11:30 PM; however the performances may move to an indoor location across the street and go later than 11:30. The Saturday workshops are from 11:00 AM -5:00 PM, but we haven’t solidified the location, however there are several options in the Brighton area next to semantics. We just met with the Contemporary Arts Center, and they are housing the Panel Discussion on Sun morning, and a Circuit-Bending 101 Workshop from 2:00 PM-5:00 PM. The fore mentioned primers at W.A.I.F. 88.3 FM, and the in-store performance at Shake It Records round out the festivities. Q: Who all is putting this festival together? Mark: Since I was asked to curate this by an artist co-op; I guess I am the curator instead of the person putting on a show (it’s all semantics). Nebulagirl has provided a wealth of advice and assistance. Nebs also came up with the Circuitastrophe moniker and got Reed Ghazala interested. The Art Damage Lodge’s Jon Johns (Jon Lorenz and John Rich) have been doing all sorts of experimental music over the years, including circuit-bending, and have been incredibly helpful in planning this event. Some of the other entities involved in organizing this event are Scot Boberg from the Contemporary Arts Center, and David Dillon (semantics, CAC), Julia Ranz from W.A.I.F., Jim Blaze from Shake It Records. There are several people within the participating organizations helping organize the behind the scenes stuff. Q: When did the idea of a festival come about? Mark: Back in February David Dillon at semantics asked me to curate a show of my own choice. I had been taking “Integrative and Robotic Art” a course at Northern Kentucky University all the while dabbling in the circuit-bending scene. So I thought these components might make for an interesting semantics project. The Robotics course was a great environment for learning about electronics. Many students in this class had varied skill sets, like welding, casting, soldering, chemistry, etc. A bi-product of this course was sharing these skills with each other. I realized that when this class was over we would lose this communal workshop. Right around this time I went to the Bent Festival MN, and the communal aspect there was very similar to what was going on in the Robotics course. I went to the Bent Fest to look at how they organized their structure, with an eye on graphing part of what they did onto our event. What was to be a robotics and circuit-bent show started evolving into my want to improve, teach, and share electronic arts in the area, and most importantly to develop an electronics community. To help develop an electronics community I am extending the concept of this festival into a bimonthly event called Solder Party. Solder Party will be a gathering of electronics people to show their projects, develop new ideas, and get help with projects gone array. The Solder Party would conclude with a jam session/demonstration, could involve visiting artists, and have themed workshops. Q: Are you looking for any more sound artist to play? Mark: Yes! We have apx. 20 performers (list changes everyday), and we have room for a few more. At the moment we have money from the door, and that’s not much considering gas prices. However, if you can work around that hurdle with merch, and other shows, we would love to hear from you. I would like to round out the symposium with some people who are way out there! People that consider worms as potential resistors, make robots that bend, work on a quantum scale, convert solar energy to chemical energy to kinetic energy to magnetic energy and can talk about it. We want people who challenge the thought processes behind electricity and electronics. Maybe we could involve phenomena besides electricity in conjunction with our electronic doo-hickies. I would like to see the symposium include artists that delve into various phenomena like x-rays, radio waves, the infrared spectrum. Or we could just get a few more people that bend and make interesting sounds. Q: What kind of other things are still needed as far as lectures, workshops, installations, etc…? Mark: I am looking at workshops, but I need to work out details. Dan Demchuk is doing a 101 workshop. Brad McCombs Northern Kentucky University professor of Art and Informatics is giving a lecture on technology, robotics, and ecology. I have approached Casper Electronics, Flower Electronics, Highly Liquid, Michael Una, Tim Kaiser, and Anode Records about workshops and or lectures. So we probably have what we can handle. But if someone has an amazing idea I can probably work it out! I am looking for people that are interested in alternative power, as well. I think it would be practical to discuss the types of energy (kinetic, potential, thermal, gravitational, sound energy, light energy, elastic, electromagnetic, chemical, nuclear, and mass) and how they are converted from one type to another. Thinking about how these alternative energy sources could power our machines; change their sounds, and visuals are potential fodder for the symposium. Q: How could one get a hold of someone, as far as being part of the festival? Q: Who all do you have booked already, and what is their role for the festival? Mark: Q Reed Ghazala (Cin): is planning to do a history of circuit-bending presentation, personal stories, slides, dye migration, and bent devices. Reed keeps changing the program, and making things bigger, so I guess we’ll find out what it is when it develops. Brad McCombs my robotics professor and colleague at Northern Kentucky University. He developed Animation Station hardware and software with Transverse Technologies. He makes robotic sculptures that interact with the environment in a symbolic or scientific manner. Mike Hancock (Heart of Palm, French Crips) is making a Barbie Karaoke multimedia installation and performance. At the Bent Festival in MN Loud Objects gave me a few “Noise Toys” to install, but they may do a larger installation. Mike Una said he will bring the updated Beat Bike, and do a solo performance with his new Drumbot. Pelzwik should have a batch of weird things at his merch table. At Bent Fest he was slapping together glitched out devices inside a plastic VHS case. I am curious to see what he brings. We are currently slotting the performers, which I will add to the comments section when completed. Q: How many days will the festival run? Q: Is there a cost for the festival? Q: Any thing else you would like to add? Mark: I wanted to thank you for interviewing me about our symposium/festival, and for getting the word out!